In ye olden days of Android, a video-sharing service by the name of Qik attracted millions of users. It grew rapidly enough to catch Skype's eye, and the larger video-based serviced acquired the smaller for a cool $150 million. It eventually shuttered the offering, and now it's bringing it back in the form of a peculiar new video messaging app. 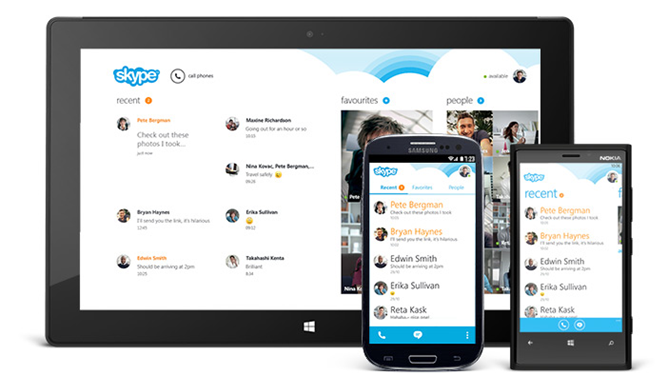 Skype Qik draws inspiration from a number of different apps. Language barriers might be a bit less insurmountable later this year when Microsoft releases the first beta of Skype Translator. As demoed last night at the Code Conference, Redmond is close to implementing near real-time voice translation of multiple languages in a Skype call. We might be getting close the the fabled babel fish. Today, Skype is delivering on a promise that it made back in July of last year. That's a long while to wait for an update, but this one is pretty major. 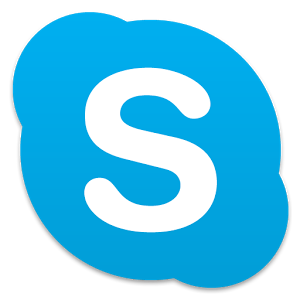 In short, the team has carefully crafted an update for Skype for Android that allows it to run in the background with virtually no impact on battery life. That's what they're claiming, anyway. 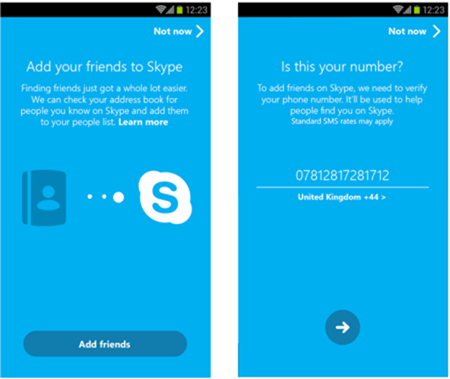 Essentially, the application (and the service as a whole) had to undergo some major re-thinking, which led to a "transformation" of the way Skype actually works. It's 2013, and chances are that someone has asked you to make a Skype video chat at some point or another. This isn't too all-consuming on PCs, where a user can fire up their webcam and tuck the Skype client away in the corner. Anyone using an Android device, on the other hand, has had to devote the entire screen to the conversation. But thanks to the latest Skype update, many of us will be freed from the burden of giving a video chat our undivided attention, as we will now have the ability to tuck the entire session away into the corner. 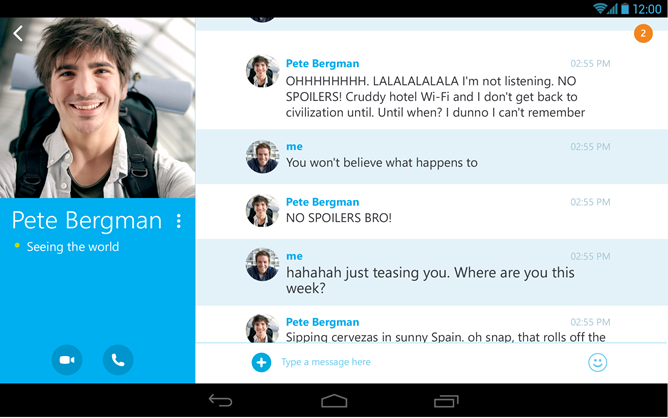 Even with Microsoft pulling Skype's strings, there are still updates coming to the Android version of the app. Skype 4.4 brings the usual collection of bug fixes and tweaks, but there's also a new tablet UI and improved video quality for all Android devices. The updated tablet UI will emphasize conversations by displaying your most recent calls and chats with each contact entry. The look and feel has been streamlined a bit too. A little more than a week ago, a major Skype update hit the Play Store with an all-new, Holo-fied look and overall sleeker appearance. But, that update also brought some annoyances, as well as its fair share of bugs. Today, Skype has released another update that should fix at least some of those issues. Of the quirks that came along with the Skype 4.0, the difficult process to sign out was among the most frustrating. 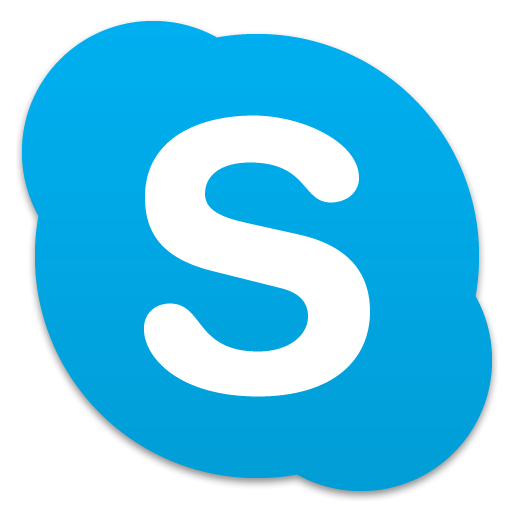 The new release doesn't usher in a wave of new features along with the new coat of paint, but Skype does boast that it is much faster and reliable, with emphasis placed on improving performance and load times.